If you want to spend your advertising budget more effectively and hit campaign goals, then it’s crucial that you gain a deeper understanding of your Google Ads campaign performance. Chances are high that a significant portion of your company’s marketing budget is dedicated to advertising on Google, since more than a third of all digital ad revenue is spent with the company, according to eMarketer. That’s more than any other digital ad platform. 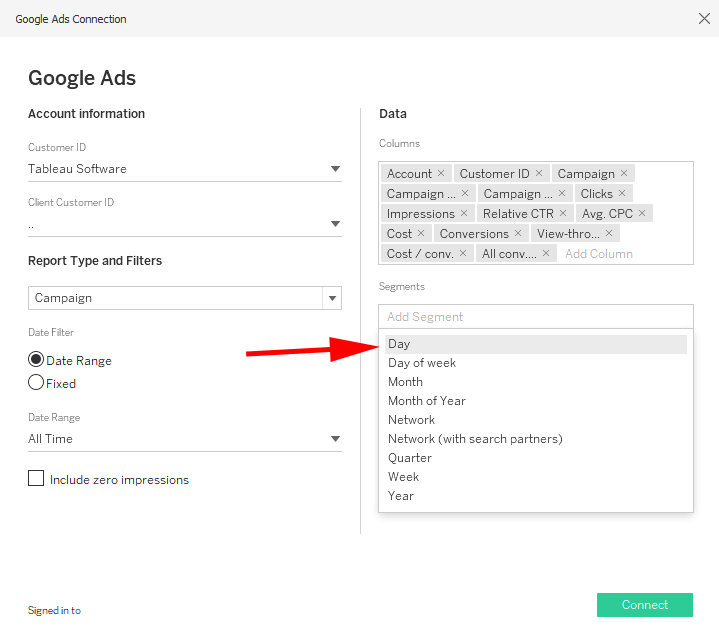 In this blog post, we’ll help you better understand the performance of your campaigns using the newly released Google Ads Connector available in Tableau Desktop. The connector simplifies the manual process of exporting data for reporting, saving you time by connecting directly with Ads data. It also makes aggregating and blending data easy, giving you one, comprehensive view of your budget and performance. We’ll review our most popular Google Ads dashboard for paid search, help you to make it your own, and guide you on the path to drill down deeper into your campaigns. To get started, find the workbook in the Resources section at the end of this post. Because Google is the largest advertising platform, it is often assumed the native reporting tools will answer all questions about ad group performance, keyword performance, or budget pacing. While there are pre-packaged reports and the ability to create additional reports, they’re not meant for in-depth analysis. Even the ability to view and compare more than one page or multiple campaign KPIs at the same time is difficult, making it especially tricky to manipulate data and analyze an entire campaign’s performance in one view. Spreadsheets as the de facto standard for analyzing Google Ads reports. Row after row of text and numbers discourage users from doing much more than asking the most basic questions. Analysis runs the gamut from simple sorting and filtering to more advanced pivot tables, graphing wizards, and other spreadsheet analytics. Pivot tables can be effective for specific and well-known analysis paths, but typically users get stuck with no opportunity to ask additional questions or drill further into their data. Prebuilt dashboard gauges that provide graphical displays of key performance indicators.These tools assume that managing an Ads campaign is simple enough to be captured by a fuel gauge and a few connected chart types. They don’t provide the flexibility to blend data sources that add context to the data or filter out results that may skew numbers. Pre-built “solutions” are simply too rigid to answer questions about something as complex and changing as a Google Ad campaign’s performance. With Tableau Desktop versions 2019.1 and later, you can connect directly to Google Ads, extract necessary fields for a time frame, and begin analysis within minutes. 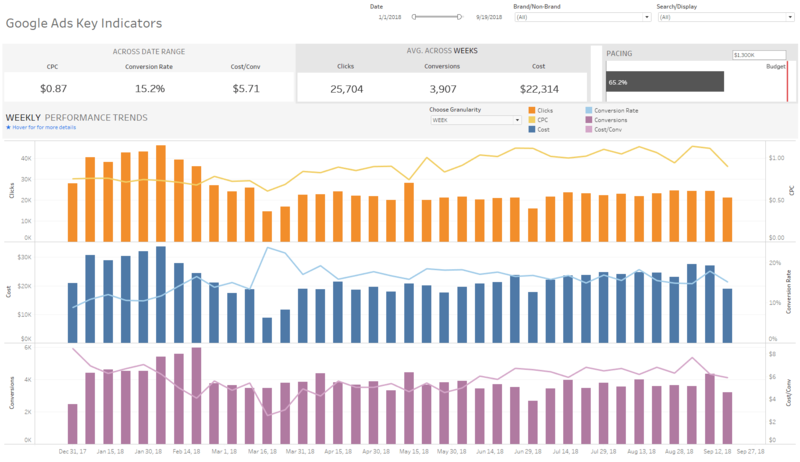 In Tableau, the possibilities for analysis paths are endless, but for the sake of this blog post, I share our most popular Google Ads dashboard to give you a starting point. This dashboard gives our digital media team an understanding of the key information about their Google Ad performance in one place. If you’re familiar with Tableau, feel free to download, replace the data source, and get started. If you need some additional help, there are instructions below that walk you through how to get started. The Google Ads Key Indicators dashboard shows our advertising campaign’s key performance indicators at the top, including cost-per-click, conversion rate, and cost-per-conversion. Those metrics, and the entire dashboard, can be filtered by date range, by brand and non-branded campaign type, and by whether the ad appeared in search or display. These filters ensure that campaigns are compared to other similar campaigns, as in apples to apples and oranges to oranges. How do I understand how my Google Ads spending is pacing towards my budget? The bar chart in the upper, right-hand corner provides context on how your budget is being spent relative to your overall budget. This graph will quickly expose an imbalance in spending—like if the year is halfway through and you’ve spent 80% of your entire Google Ads budget. How are my Google Ads campaigns trending over time? The trend graphs for your critical campaign KPIs can give you context around whether your efficiency is improving or decreasing, showing if action needs to be taken. By selecting Choose Granularity and selecting month, week, or day, the viewer can get both the high-level-view and the front line view in the blink of an eye. 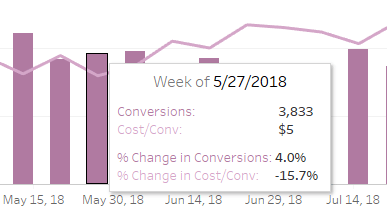 What were my month-over-month, week-over-week, and daily changes for key Google Ads metrics? By hovering over the performance trends graph, you can compare the previous period’s paid search KPIs to time period you’re examining. Start Tableau and under Connect, select Google Ads. Sign in to Google Ads with your email address, then select Next to enter your password. Select Allow to authorize Google to securely share your data with Tableau Desktop. Go through the dropdown options in the connector window and select which Report Type and Filter is relevant to you. For this specific, paid-search pre-built dashboard. 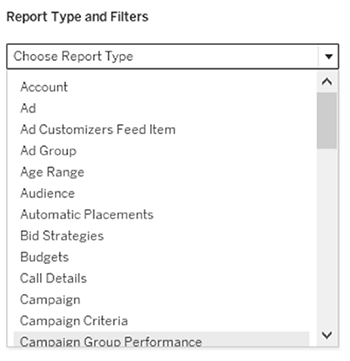 Choose Campaign as your report type. Select the date range you want to analyze. Right click the data source Sample – Google Ads Data on the top right and select Replace Data Source. Once you’ve started working with this dashboard, you may have additional questions of your Google Ads data. Here are some next steps to help you customize your dashboard for your needs and uncover deeper insights. Drill down into the details. By creating a new tab and adding the Campaign field to the rows shelf and measures of interest to the columns shelf, it’s possible to quickly start identifying the performance of your individual campaigns. Experiment with new views like scatter plots to identify outperforming campaigns. Create custom filters. If your campaign names follow a naming convention, you can use them to create filters that allow you to view only specific campaign types. For example, maybe you want to view campaigns that are in a specific language. We’ve already created one such filter in the dashboard for you. Right click on the Brand/Non-Brand measure, select Duplicate, and then create a new filter that meets your campaign namings criteria. Blend in data for context. It’s common that important campaign information exists outside of the Google Ads platform—frequently stored somewhere in a spreadsheet (or three). You may want to see the performance of ads created only for a specific product or those that target a specific sub-segment. Or you might want to see the headline and body copy next to the campaign name to examine how ads that mention “discounts” perform. By connecting to Google Sheets or an Excel document with the Campaign field, you can then blend in the needed information for added context. Share your results. Tableau Online and Server allow you to securely publish your dashboards and make them available to others in your organization. Use your dashboard to start a conversation and identify the next path for your analysis. Explore more Google Ads data. If you’re currently doing analysis on the data in the Google Ads platform, then Tableau’s Google Ads Connector offers access to it. When you’re connecting to Google Ads, select the Report Type and Filters and explore the data fields available to find what you’re looking for. If you’re ready to start connecting data sources like your Google Ads data and CRM solutions or marketing automation systems into one accessible view, check out this whitepaper, Unifying Your Marketing Data for Greater Results. Download the workbook used in this blog by clicking here. 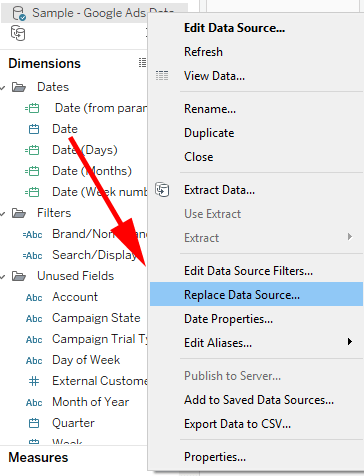 Tableau Help offers important considerations when using the online connector, especially around data definitions and how to improve performance. Upgrade to Tableau 2019.1 to try the connector.